Yesterday morning – and the evening and night before – this was a paradise. Crystalline water where you saw little fish passing in small swarms alongside the boat, cloudless skies, the slight splish-splash of the water, and peace. 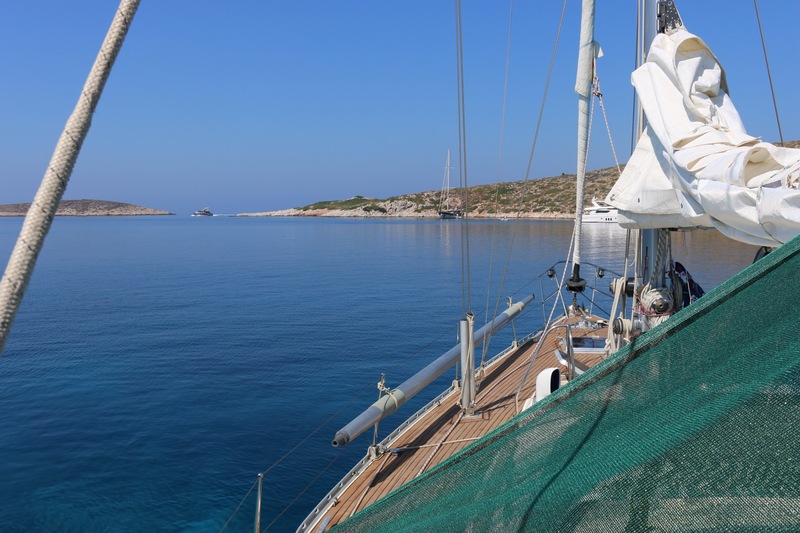 This is the island of Arki in the Greek Dodecanesos islands where I usually pass my summer vacation on a sailing yacht. Life on a sailing boat, if lived in the appropriate way, is simple and sportive, and what you enjoy is not the life in the port where during this time the annual competition of vanities takes place; it’s not luxurious restaurants and expensive Spas and swimming pools or overcrowded beaches. You enjoy tranquility instead, the peace of a quiet morning or night, simple meals cooked on board, sometimes improvising because you haven’t had the chance to visit a food store before finishing part of the food reserves. It’s traveling with the wind (in Greece usually there’s fairly enough of it), using the elements to push or pull you forward, waiting for dolphins to show up and sometimes having to change plans because of the weather forecast. To fully enjoy a sailing boat, you need a good captain, and luckily, I have one and he’s even a family member. So I have this incredible chance to live the Mediterranean Sea in the best way, with few people on board. In the morning, I got up early and had my swim and breakfast with the panorama on the picture above. Around 10 am, the peace was over. 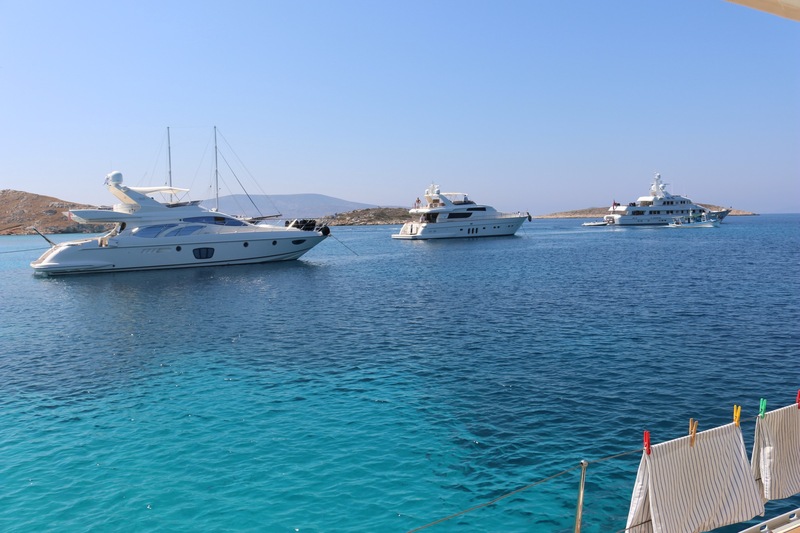 An infinity of big motor yachts invaded the small bay where we had passed the night and transformed the tranquility of this place into a city with troubled water, music, and the noise of the big engines. The magic of the moment, the beauty of the place, was immediately destroyed. I’ve had this feeling over and over again during these trips, but also years ago in Abu Simbel in Egypt. We traveled all the desert coming from Aswan to reach Abu Simbel at a time when all visitors were already gone. I lived that place with an unseen magic, it was silent and you could feel the enchantment of the stone. Years later, I came back with a group of people and the crowd I found there destroyed any magic that place could ever have. What is it? Why does man destroy every good vibration as soon as he’s present in large numbers (sometimes also two are enough)? Is it the vibration of mankind that is so negative? Animals don’t have the same effect. I thought about this this morning. Man has been showing little respect for nature and its resources, for the beauty it offers when still untouched. Man has destroyed great part of his home – not having any chance of moving into another one for now – and has acted with unimaginable egoism and cruelty towards other species and even members of his own. And it’s going on. What I’m living here today is only a small expression of this. And somehow, this morning I had the feeling that we’re being tuned the wrong way, that the frequency mankind has as a whole is in perfect disharmony with the nature that created it. For me as someone who has been researching the nature of music, sound, frequencies and vibration and their effect on living organisms for many years, this thought is very interesting and anything but fallacious. A side-thought, connected to the missing respect for nature, is also this: motor yachts of this kind consume at least 200 liters of fuel per hour. Every year, there are more of them everywhere in such places. Who has the money to not only buy a motor yacht, but pay a vacation with it, while allegedly the world economy is in deep crisis? Maybe the bad vibrations in part are created by the presumption that comes with a certain kind of wealth. And who are the people who don’t think about what they’re doing, using the Earth’s resources for such personal pleasure without ever giving anything back? Something is not right in this world. Where are we going?